Awesome! Thanks Joe! My grandson will love it , gonna makle a Xmas card for him with it! OKeee? Thanx DanaTA for the mirror. Thank you JoeQuick, and thank you DanaTA. The turtles look great. Needs Genesis. But I think the rest is complete. There is a bandwidth issue with the original link. Try mine just above. I can provide an additional link via my Mediafire account. I have unlimited bandwidth and downloaders will have unlimited speed. Quick question about the commercial restriction, before I send my daughter's Taekwondo teacher into fits of delight... does internal use at her school, such as sign up sheets for school events, count as commercial? Not advertizing material/website images, but, for example, signup sheets for the "Parents Shop, Kids Chop" event they had last weekend (which I think was free.) or signing up for rank advancement testing. Those who have the files have my permission to create mirrors and post the links here. I'd handle it myself, but it's not something I can sneak and do on my iPhone at work. So really, anyone who wants to mirror it has my permission. We can clean up the surplus and find the file a stable home later. Will you keep that up long? 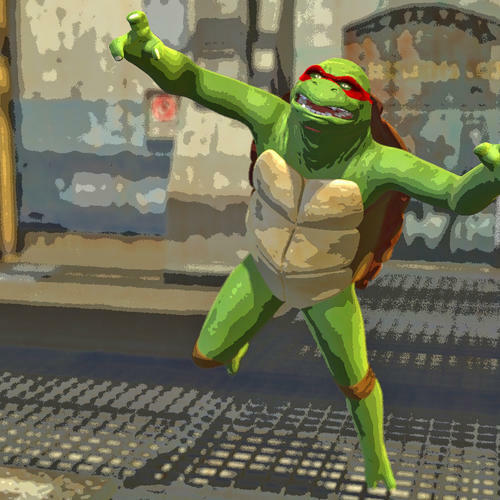 I'm still working on the Day 1 goodie download (I had around 20 hours left to go, so that's another almost week of downloading for me *sigh*), and then the turtle goodie looks like it'll take 12-13 hours on it's own. Don't want to start it and have it disappear on me :P I can get it elsewhere eventually if it won't be up very long. Just wanted to ask ahead of time! I'll keep it there as long as Joequick wants me to keep it there. If he asks me to remove it, I will...but notice will be given here for at least one day, to avoid doing that to you or anyone else. Wonderful gift, Joe. Thank you very much. And thanks also to the gift-givers of the previous days; I may be a trifle behind, but I appreciate it all. presented by our DAZ PA Shader Savant, zigraphix!!! "This is a simple ToonCam saved as a partial scene, so it’s load, point, shoot, and all surfaces are toonified. :D"
Far out, when I started to download the first gift, there were 4 pages of replies. I started to read the replies and each page read had another pages of replies added. Thank you Horo and David for the gift and AprilYSH for the thread. And big happy and safe season for all. A toon camera what a great idea, thanks! A specific thank you to Horo for the mp4s, which explained in clear detail why my attempts, thus far, to get HDRI images and lighting set up with UE2 had not worked! A general thank you to all the PAs who have given such generous gifts!